Apr. 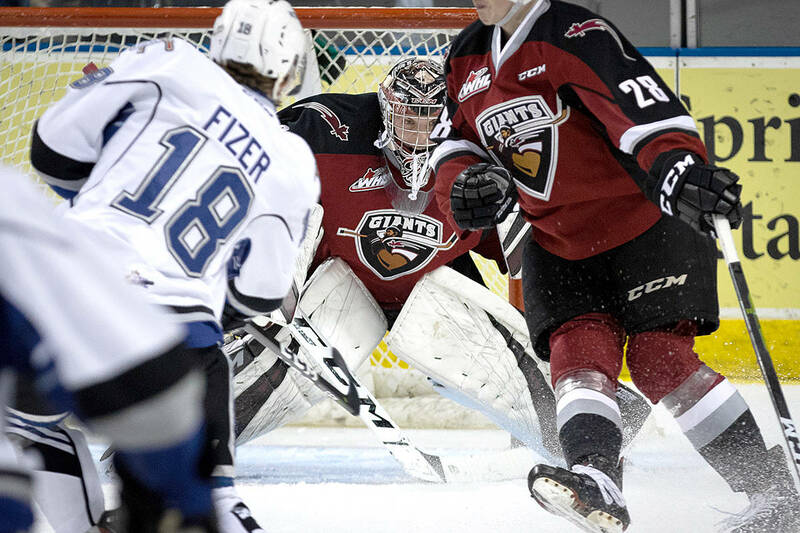 9, 2019 11:30 p.m.
Vancouver Giants took Game 3 in overtime against Victoria, giving them a 3-0 lead in the Western Conference semifinal series. The next game, Thurday in Victoria, could decide it all. The Lower Mainland-based G-Men are in Round 2 of the series, having originally defeated the Seattle Thunderbirds 4-2 in a best-of-seven Round 1 series. Now, they’re up against the Victoria Royals, and after two victories on home ice in Langley this past weekend, they took down Victoria again Tuesday night by the score of 5-4 in an overtime goal by Owen Hardy – his second of the game. But the victory wasn’t a slam dunk. In fact, the Giants proved to be resilient foes for the Royals, and that’s the only reason they managed to literally push the Royals to the brink of elimination Tuesday night. Three different times they trailed and three different times they fought their way back en route to a 5-4 overtime victory over the Victoria Royals, explained Giants play-by-play broadcaster Dan O’Connor. Owen Hardy’s second goal of the game at 13:34 of overtime helped cement the 5-4 victory for the Giants. Other goals came courtesy of Jared Dmytriw, Milos Roman, and Alex Kannok Leipert. Bowen Byram added two assists. Mitchell Prowse (1G, 1A) and Scott Walford (2A) each had two points for the Royals who got 52 saves from Griffen Outhouse. The Giants got 16 saves in response from Trent Miner, who improved to 4-1 in the playoffs. The Giants will now look to earn a berth in Round 3 of the playoffs with a victory Thursday night in Game 4 in Victoria. If there’s a Game 5, it plays out back at the Langley Events Centre on Saturday night. The puck will drop at 7 p.m. Tickets might still be available. VAN – At 3:32 of the first, Giants captain Dmytriw potted his second goal of the series off a rebound. Evan Patrician and Dallas Hines both assisted. VIC – Back came the Royals at 9:10 when Scott Walford’s point shot was tipped home by Sean Gulka who parked himself in front of Miner. Gulka’s second of the playoffs was also assisted by Tarun Fizer. VIC – With 29 seconds left in the first period the Royals took their first lead of the series thanks to a power play goal from Igor Martynov (2). Martynov took a feed from Scott Walford in the slot, spun around and fired a forehand shot by Miner. VAN – At 3:44 of the second period Roman one-timed home his second goal of the playoffs off a wonder cross-ice feed from Byram. Plouffe also assisted on Roman’s power play goal. VAN – 14 seconds into the third period Owen Hardy got the Giants back even when he skated down the left-wing, hopped on a Byram drop-pass and blasted home his first of the playoffs past Outhouse. Holt notched the second assist. VIC – Carson Miller gave the Victoria Royals their third lead of the night at 10:15,right as a Giants penalty had expired. He took a pass beside the Giants net, spun to his forehand and placed a low shot past Miner’s stick to make it a 4-3 score for Victoria. VAN – For a third time the Giants managed to claw their way back. Kannok Leipert answered with an equalizer for the Giants at 15:40 off a shot from the left-wing circle to tie the game 4-4. Kannok Leipert’s second goal of the playoffs was assisted by Tristen Nielsen and Davis Koch. 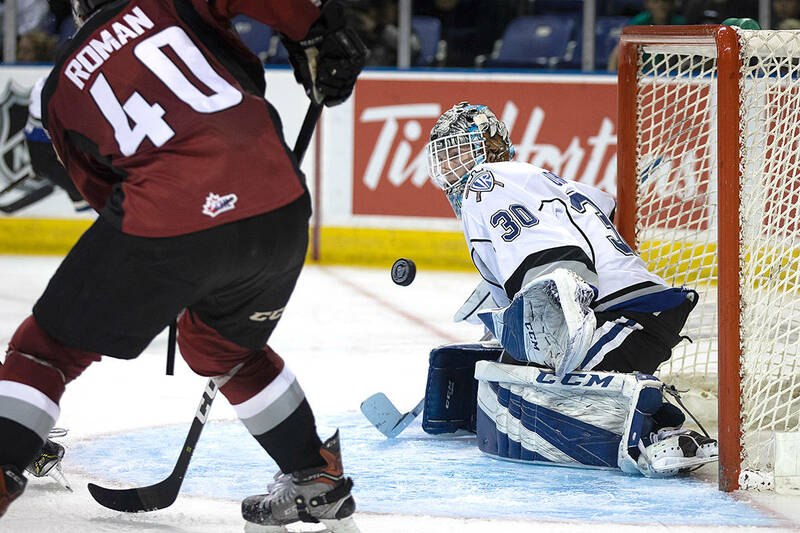 VAN – Hardy helped complete the victory for the Vancouver Giants at 13:34 of the first overtime period when his backhand shot from the left side of the Royals goal snuck across the line. Seth Bafaro and Holt assisted on Hardy’s first career overtime winning goal. • Vancouver Giants have now won five straight playoff games dating back to Game 5 of Round 1 on March 29. • The G-Men’s power play has now scored in eight of their nine playoff games so far. • The trio of Jared Dmytriw, Owen Hardy, and Dawson Holt have now combined for five of the 10 goals scored by the Giants so far in the series. • With two assists on Tuesday, Byram now has three goals and nine assists for 12 points. He sits second in the WHL in playoff scoring behind teammate Koch – who has 13 points.